A major touristic attraction in itself, Cluj is also the ideal place to launch in the exploration of Transylvania, a land of contrasts, where modernity meets legend at every step. Cluj is Romania’s largest city after Bucharest. 324,000 people live in Cluj, with other tens of thousands working or studying in the city, which is the seat of the county of the same name. The official name of the city is Cluj-Napoca, although the full name is little used outside of official documents. “Napoca” was added to the name in the 1970s, to emphasize the Daco-Roman legacy of the city. The Hungarian name of Cluj is Koloszvar, while the German name is Klausenburg. It’s widely believed that the name Cluj comes from the Latin “clausa – clusa” which means “closed place” or “ravine”, referring to the hilly terrain nearby the city. Cluj has been the capital of the Principality of Transylvania during the time when the region was part of the Habsburg Empire. Prior to that, the city was one of the centers of power of the Hungarian Kingdom. Cluj is located at roughly the same distance of three capitals – Bucharest, Belgrade, and Budapest. Cluj is one of the few cities in Romania that emerged almost untouched from the urban systematization carried out by the Communist regime. As a result, vast swaths of historic buildings and streets are preserved to this day. Cluj is a city of culture. Tens of thousands of students from all over the country attend the several prestigious universities of the city, and participate in its cultural life. Cluj is also home to some of Romania’s best theaters, libraries, philharmonics, and other cultural establishments. A city of festivals, Cluj is home to many annual cultural events, including the Transylvania International Film Festival (TIFF), Electric Castle, UNTOLD, and the Cluj Musical Autumn, a classical music festival. Thanks to its young and dynamic population, Cluj boasts a vibrant nightlife. The city is home to the best restaurants, bars, and clubs in Transylvania. 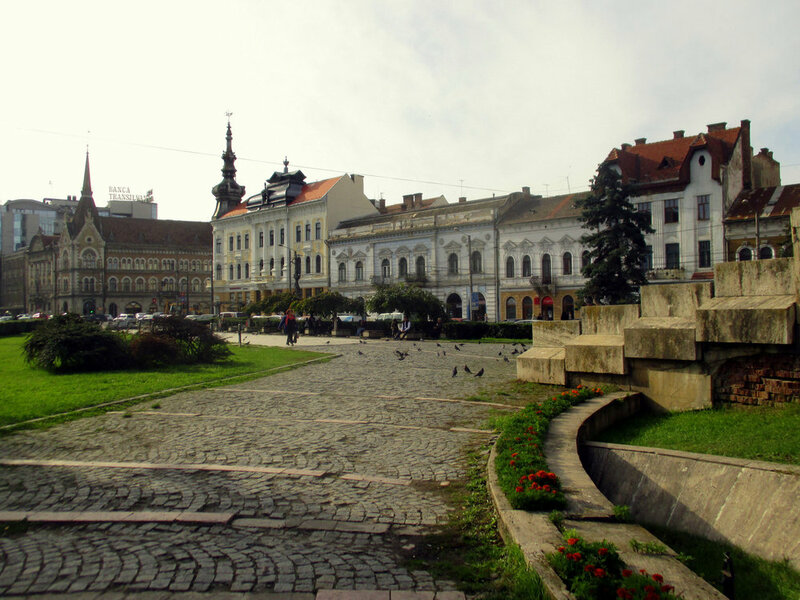 Start your exploration of Cluj from its heart, Union Square (Piata Unirii). Situated in the center of the city, Union Square is lined with historical buildings, including the beautiful Continental, built in 1895 in an eclectic style, the old town hall, Rhedey Palace, Josika Palace and more. At 220 by 160 meters, Union Square is one of the largest plazas in Romania. The magnificent St Michael Church, built between 1350 and 1487 stands tall in the center of the square, with its 50 meter bell tower, the tallest in the country. Another landmark of the Union Square is the equestrian statue of Mathias Corvinus, a king of Hungary, born in Cluj. For the best views of Cluj, climb the Cetatuia Hill. The name means fortress in Romanian, and comes from the fortification built by the Habsburgs in the 18th century to control the city. Today, only two gates and portions of the wall remain of the fortress, which served as a prison for the leaders of the 1848 revolution. The Hotel Belvedere and a giant iron cross are two other attractions that can be visited on the hill. The Cetatuia hill is located in the center of the city and a flight of stairs makes the top easily accessible. The Tailors’ Bastion is one of the few remaining elements of the medieval fortification that protected Cluj. Its name comes from the tailors’ guild, whose duty was to man the bastion and the nearby walls in case of danger. The bastion was built in the 15th century and restored in 1629 on the orders of Prince Gabriel Bethlen, who gave the construction its second name, Bethlen’s Bastion. Nearby the bastion lies the statue of Baba Novac, one of the commanders of the Romanian national hero Mihai Viteazu, who was executed on that spot in 1601. The Botanical Garden in Cluj is one of the largest in Southeastern Europe, housing a collection of over 10,000 plant species. From tropical and desert species to flora that is specific to Europe, Asia, and other continents, the garden is a must see for any tourist interested in wildlife. Some of the most interesting attractions are the Japanese garden, the desert plants collection, and the huge Amazonian lotuses. You and your family will find plenty of new things to learn in one of Cluj’s many museums. The Pharmacy Museum is one of the most unique –located in Union Square, this establishment functions in Hiltz House, the building where the first pharmacy in Cluj was opened in 1573 and functioned continuously until 1949. The Art Museum, which functions in the Banffy Palace, built in 1775, features collections of paintings, sculptures, engravings, furniture, weaponry and more, organized in 22 exhibition halls. The Romulus Vuia Ethnographic Park provides a respite after the hustle and bustle of the city. The park is situated on the outskirts of the city and is actually the outdoors exhibition of the Ethnography Museum. With over 90 traditional Romanian, Saxon, and Hungarian buildings, the park provides a glimpse of the traditional way of life of inhabitants of Transylvania. Highlights include the wooden churches and the traditional artisan’s houses. Cluj is perhaps the best place to launch in an exploration of the nearby Apuseni Mountains. Part of the Carpathians, the Apuseni (Western) Mountains offer magnificent landscapes, rich wildlife, and a thriving traditional culture. The Scarisoara Cave, which hides Europe’s second largest underground glacier, is a marvel of nature. The Apuseni Mountains National Park, southwest of Cluj, shelters hundreds of caves, spectacular ravines, lakes, and other forms of karst relief. Visit the Saxon citadels of Transylvania – Cluj was one of the Siebenburgen, the seven cities of Saxons, German colonists who settled in Transylvania in the 13th century. From Cluj, it’s easy to take day trips to the surrounding areas that boast a rich Saxon heritage. Some of the most inserting destinations are the cities of Bistrita, Sighisoara, and Sibiu. A major economic center and a transportation hub, Cluj is easily accessible, both from Romania and from abroad. The city is well connected by road and railroad, and has a busy international airport. There are regular flights to many European city, operated by several companies, including low cost ones. To get around the city, you can use the network of trams and buses, but you may be better off taking a cab. Taxis are fairly cheap and safe – just make sure to pick cars that display the tariff and the company they belong to.